The psych ward in Glass. 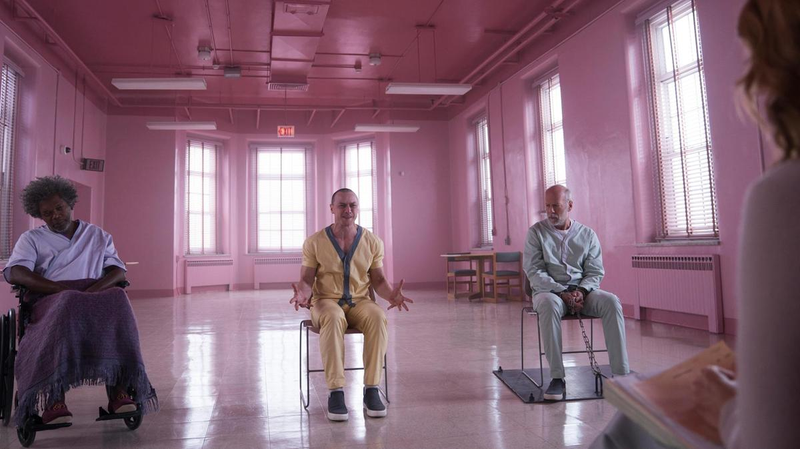 Talking to Entertainment Weekly, M. Night Shyamalan, director of Glass, the latest film in the trilogy he began with Unbreakable in 2000, spoke about the film’s ending, and how it was, for him, at least, a long time coming. In the ending of Glass, in case you need a refresher, things get pretty hectic. Elijah Price (Samuel L. Jackson) is killed by Clarence Wendell Crumb (James McAvoy); Crumb and David Dunn (Bruce Willis) are both killed by a secret anti-superhero organization; and Price’s mother (Charlayne Woodard), is able to release surveillance footage from Crumb and Dunn’s conflict proving that, yeah, superhumans are real, isn’t that wild? In One Flew Over the Cuckoo’s Nest, Chief fulfills his friend’s hope of escape; in Split, Price’s mother fulfills the dream of the movie’s cast to prove themselves as real, whether real heroes or real monsters. It’s a powerful influence, even if Split didn’t handle that finale as gracefully as we would have liked.